The core studies create a foundation for the chosen professional field, which will be further consolidated in professional studies. The programmes include a 30-credit work placement, where students get to apply what they have learnt and acquire information about business operations in practical situations. Usually work placements also offer good opportunities to find a permanent job. In many cases, students complete their 15-credit Bachelor’s theses on commission from businesses and this contributes to supporting their specialisation in their chosen area. The programmes require completion of general upper secondary school or an upper secondary vocational qualification. Holders of further or specialist qualifications can also apply to a UAS. Open UAS provides a track to UAS studies for those without the required prior education. 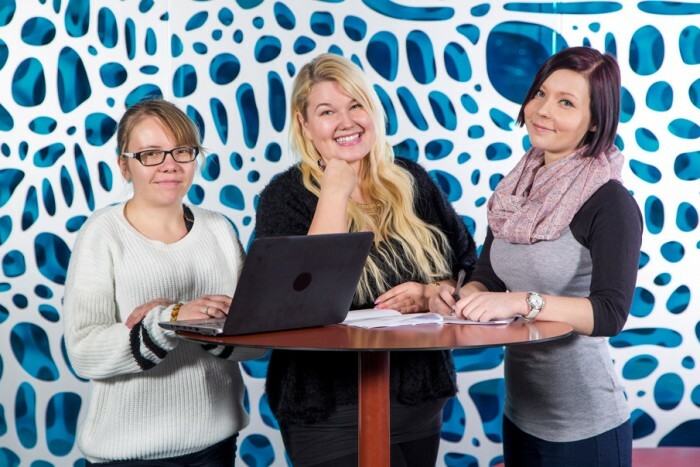 You can study for the Bachelor’s degree in Business and Administration in Finnish, Swedish and English. A UAS Master’s degree provides an opportunity to continue your studies after three years of work. UAS Master’s degrees are parallel to university Master’s degrees. A key feature of UAS Master’s degrees is development of business operations. The scope of a UAS Master’s degree is 90 ECTS credits and it can be completed while working. Applicants to Master’s degree programmes are required to have acquired at least three years of work experience after completion of a UAS Bachelor’s degree. The degree title of those graduating from English-language degree programmes is Master of Business Administration (equivalent to the Finnish degree title tradenomi, ylempi AMK). Business Administration programmes provide students with extensive business competence, covering the key aspects of business and organisational operations. Students also become familiar with R&D activities as part of the field. In addition, students receive more in-depth competence in specialisation areas offered by the UAS, such as human resources administration and management, corporate law, public administration, international business, logistics, advertising, marketing, sales, financing, financial management and entrepreneurship. Studying is diverse, combining practical work and sufficient theoretical studies to support it. Instruction is carried out making use of diverse methods, including direct contact teaching, independent assignments, teamwork and e-learning. Professional skills are developed through teamwork assignments and projects carried out for businesses that hone students’ teamwork, interaction and performance skills. Students can also complete studies included in the degree abroad, which promotes their international careers. You can study for the degree in Finnish, Swedish and English. Business Administration studies are suitable if you are interested in business competence, development of business operations and entrepreneurship. You can expect to find diverse work assignments with different people in various organisations and public administration, often involving different languages and cultures. It is also important for you to be interested in what is going on around you, because business contributes to building the future – either through existing business operations or through your own entrepreneurship. Management Assistant programmes provide students with a unique combination of competences in languages, communication, business administration and assistant work. The programmes prepare students to work in multidisciplinary and international assignments. You can complete the degree in Finnish, Swedish or English. Please bear in mind that the joint application period for English-language Bachelor’s Degree programmes is in January.